As I mentioned in my previous post, I love making things from scratch. That being said; this post is dedicated to the homemade granola bar. As a kid, I never really cared for them…at all. They would end up as a last resort in the bottom of my backpack. I had to be incredibly desperate to eat them. When I did, I never enjoyed them because they were far too dry. I think the only ones that I ever truly found satisfaction with were the chocolate coated ones, although now I acknowledge that it’s not the healthiest option available. 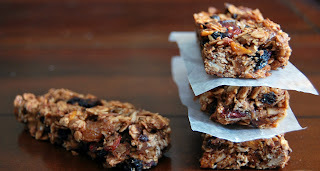 I was intrigued months ago when I bookmarked this recipe and hoped it would change my feelings about granola bars. I think I’m turning, slowly. Gavin was delighted with the way they turned out, but I highly recommend waiting 2-3 hrs prior to cutting the bars (he wanted to eat them 5 minutes after they came out of the oven!). They need to cool completely and stiffen otherwise they’re too soft and crumbly. These granola bars do not take long to make, and are perfect for the on-the-go breakfast. You can substitute it with a variety of dried fruits, drizzle with chocolate (I had to resist the urge!). I loved that honey and a little bit of brown sugar was all that was necessary to sweeten the granola bars. Plus the fact that the ingredients are simple yet work so well together. I am definitely making these again, and will experiment with different combinations! Preheat the oven to 350 degrees. Butter an 8X12 inch baking dish. Stir the oatmeal, almonds and shredded coconut together in a sheet pan and bake for 10 to 12 minutes, stirring occasionally, until lightly browned. Transfer to a large mixing bowl and add the wheat germ, stir well. Reduce the temperature of the oven to 300 degrees. Melt the butter over medium heat. Stir in the vanilla, honey, brown sugar and salt in a small saucepan. Bring ingredients to a boil over medium heat. Cook and stir for a minute, then pour the sauce over the oatmeal mixture. Stir in the currants, apricots, cranberries and chocolate chips and mix well. Pour the mixture into the prepared pan. Wet your fingers and lightly press the mixture evenly into the pan. Bake for 25-30 minutes, until lightly golden brown. Cool for 2-3 hours prior to cutting into squares. Serve and enjoy at room temperature. These look really good to me and I need to make them! I love having this type of thing on hand for my boys to grab while they are running out the door. So much better for them than the packaged variety. I agree! Making foods from scratch are so much better than from a box! I could eat granola bars from the box (then again, I'll eat just about anything that isn't cringe-worthy or has meat). Love the photos, and I'm sure this will be a good granola recipe too if you just spread it out instead of making into bars. 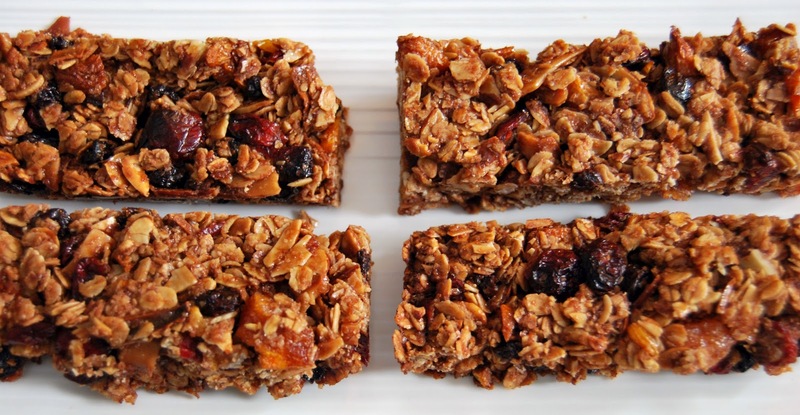 What tasty looking Granola Bars! I would have to resist the urge to smother them in chocolate as well, but I do appreciate healthy snacks with lots of fruits and nuts mixed in. Homemade Granola Bars are really the only way to go, I think. I'll have to try these sometime. Hi Alexandra! Thanks for your comment. I checked out your blog and I absolutely love it! Excellent pictures...the food looks amazing! I am following you on twitter now!